For Lent this year, I chose to add this jigsaw puzzle by American artist Charles Wysocki. On one level it’s a stylized version of Americana–a rural setting with a large sheep in the foreground, with more sheep, simple buildings, and trees in the background. 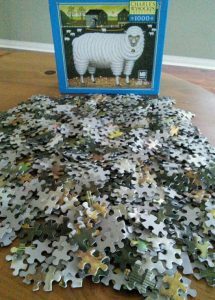 And yet for me this jigsaw puzzle has also become a way of slowing down and becoming quiet. I’m not particularly legalistic about it. I don’t have to work on it every day. I don’t have a deadline of completing it before Lent is over. But every so often I pause to put a few more pieces together–a few moments in the morning or on my lunch break, perhaps alonger time some evening. I chose this puzzle in part because of the title. Charles Wysocki called it “Shepherd’s Pal” which is so appropriate for this Lenten season as I reflect on Jesus, the Great Shepherd, the One who lays down his life for his sheep, who knows each one of us by name and calls us (John 10:1-18). It reminds me that whatever I might do, whatever roles I might have in life, I am the Shepherd’s pal so to speak–a follower of Jesus with the great honor of being called his friend (John 15:15). This jigsaw puzzle also helps me to connect with the brokenness and healing of God’s family. As the body of Christ, the church is meant to be whole and healthy, to function together with each part contributing to the whole (1 Corinthians 12:1-31). To change the Pauline metaphor, perhaps we could also say that the church is like a giant jigsaw puzzle where each piece is part of the bigger picture. Only it seems we haven’t yet figured out how to put the pieces together. What’s more, we sometimes seem unsure that we’re even part of the same picture. There is so much brokenness–within local congregations and between them, in denominations and in between, over biblical teaching and theology, over the definitions of right and wrong, inside and outside. Jesus’ prayer for unity (John 17:1-26) has not yet been fully accomplished. And so as I sort through the pieces of my jigsaw puzzle and put them together, I also sort through my questions. Are difference and disunity in this life and in the church inevitable? Is it too simplistic to expect that all of the pieces will fit together smoothly with no missing pieces and no extras? Do we rather need to accept our brokenness with humility as a kind of gift? My questions dissolve to prayer. I don’t yet have everything together in the perfect picture—not in my jigsaw puzzle and not in the brokenness I see all around me in the church and in the world. I long to heal all those wounds and make all things right, but I am not God. I am not the Great Shepherd, only the Shepherd’s pal. So I pray, Lord, have mercy. Christ have mercy. And I wait for the One who “is before all things, and in him all things hold together” (Colossians 1:17). Amen. April Yamasaki is a pastor and also the author of Sacred Pauses: Spiritual Practices for Personal Renewal. She has recently completed a companion resource–the Sacred Pauses Group Leaders’ Guide and Scripture Index is now available as a free download from her website, aprilyamasaki.com.